TEKS-tivity books are designed to provide hands-on TEKS activities and additional practice problems to step up to a whole new level of differentiated learning! TEKS-tivities break the TEKS up into teachable units by reporting categories but also include flexibility by including TEKS from other reporting categories when appropriate. Teachers and instructional coaches designed the TEKS-tivities to address student learning by incorporating TEKS where they fit best. Every TEKS-tivity includes a Reflection Page or a Summary of Learning for the activity. This student reflection reinforces learning to ensure that students are making meaningful connections with the concepts. This process leads students through the steps of true mathematical fluency. A Unit Assessment is provided at the end of each unit in order to aid in tying the activities to learning. This deepens the students’ understanding of underlying mathematical concepts. The teaching notes include facilitating questions to accompany each of the activities as well as the directions for the activities. It is important to use the questions to lead the discussions during and after the activity to help students process meaningful learning. 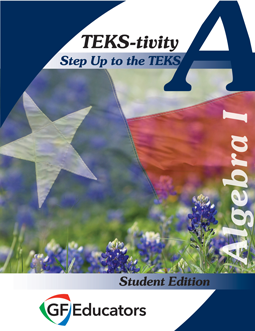 View a Sample of the Algebra I TEKS-tivity Student Edition by sending an email to info@stepupteks.com asking for the password. Accompanies the Algebra I TEKS-tivity Teacher Edition.